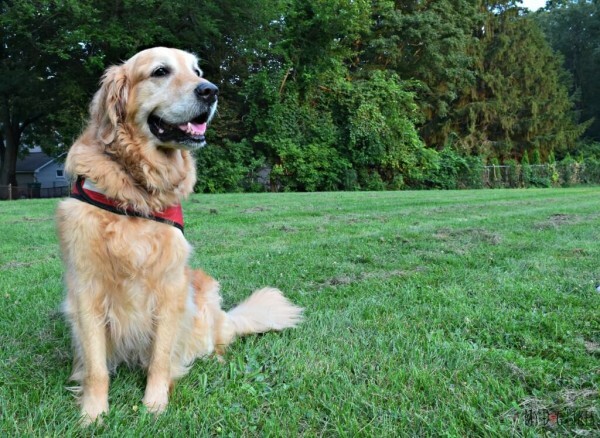 MyDogLikes is one of our favorite dog blogs. 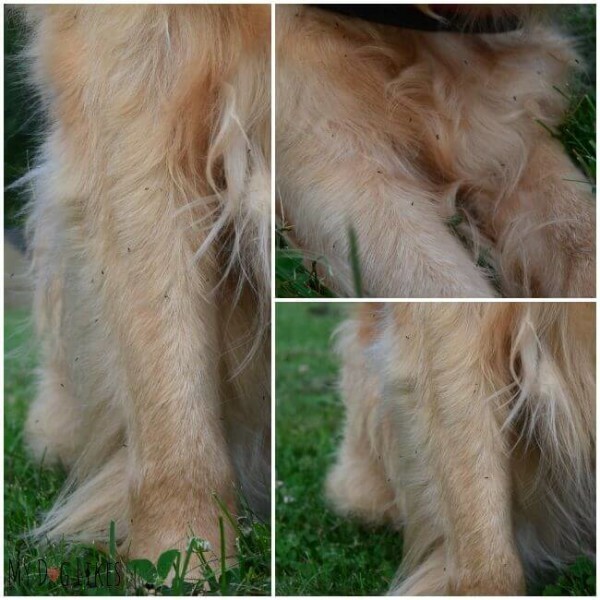 This is a post about Dr. Harvey’s Natural Products for Flea and Tick Protection. Take a moment to read what they learned on their quest for a natural alternative to strong chemical repellents. It was written by Kevin in collaboration with Rachael and Charlie and Harley. We are very careful about what we put into our dogs’ bodies, feeding and researching the best food, treats, and supplements. Doesn’t it make sense that we take a closer look at what we put on their bodies? 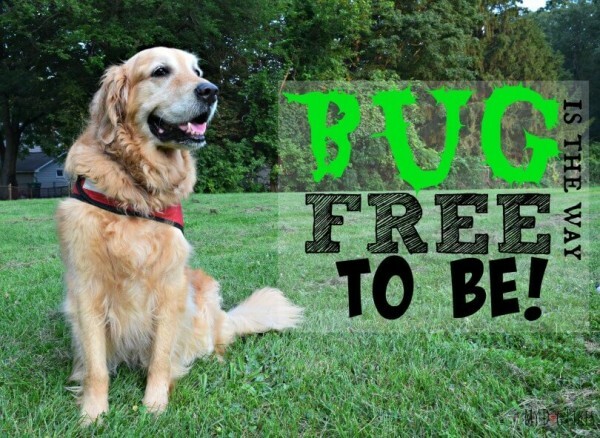 Take a moment and think about traditional flea and tick prevention. These topical applications soak through the skin before making their way into the bloodstream. Here, they remain for a month or more in a concentration strong enough to kill fleas and ticks at first bite! Sounds a bit scary doesn’t it? While there is certainly a time and a place for these medications (geographic location, seasonal concerns, etc) we can’t help but wonder if dogs require such an invasive treatment year round? No single option is “one size fits all” and the choices that a pet parent makes may vary based on his/her own unique situation. 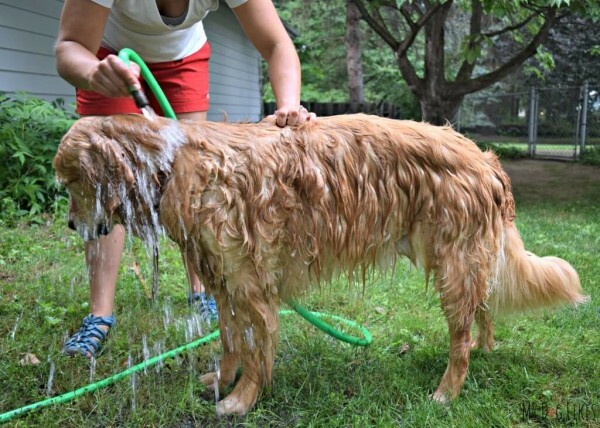 At MyDogLikes, we have always been of the mindset that, whenever possible, a natural solution is always preferred. Why expose our animals to any unnecessary chemicals and pesticides? Over the past several months we have started to introduce you to the wonder that is, Dr. Harvey’s. If you’ve been following along, you already know that they make some of the highest quality dog food available, but this friends, is just the beginning! 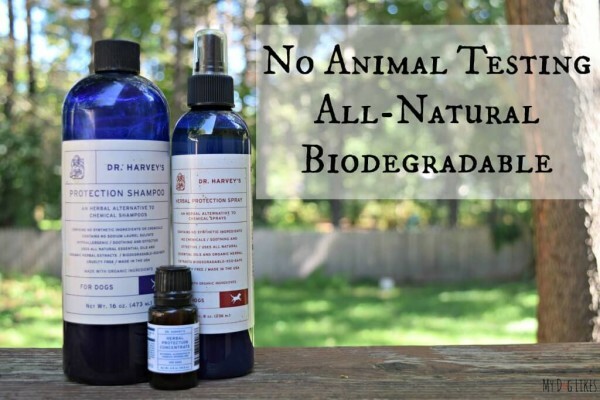 Dr. Harvey’s makes treats, supplements, and most importantly (for today), natural grooming products for your best friend! Why not? For thousands of years people all over the world have utilized the natural pest repellent properties of essential oils such as citronella, cat nip, and lemongrass. Years ago as we adopted a more natural lifestyle and started to focus more on what goes in and on our bodies, we stopped using chemical bug sprays on ourselves. Over time we have found that many of the natural solutions on the market work just as well (or better) than the ones filled with nasty chemicals. We were very excited when we found out that Dr. Harvey had harnessed these same essentials oils to protect our pets in a more natural way. 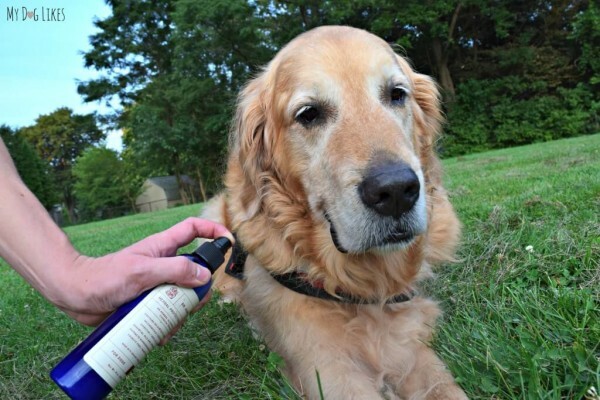 Designed to be sprayed directly on your dog’s coat, this solution uses the natural pest repellent properties of essential oils to keep insects OFF your dog. Dr. Harvey’s Herbal Protection Spray contains no synthetic ingredients and has a pleasant herbal smell. Simply shake and spray before and after a walk to help keep pests at bay! Just take care not to get any in the eyes! This product can also be applied to collars, leashes and bedding. 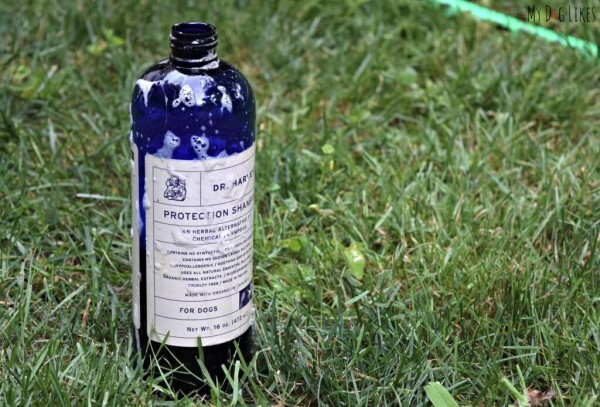 Dr. Harvey’s Protection spray utilizes several substances shown to be natural insect repellents including Catnip Oil, Citronella Oil, Erigeron Oil, Neem Oil, and Cedarwood Oil. BEFORE applying Dr. Harvey’s Herbal Protection Spray! In our area, an EXTREMELY rainy spring has led to a particularly buggy Summer. Whether they are chemically protected from infestations, or not, who wants to see their dog being swarmed with bugs on a nightly walk? We have used this spray regularly all summer long and can vouch for its effectiveness. Check out some of these before and after photos to see for yourself. AFTER application! Bye-Bye bug swarm! 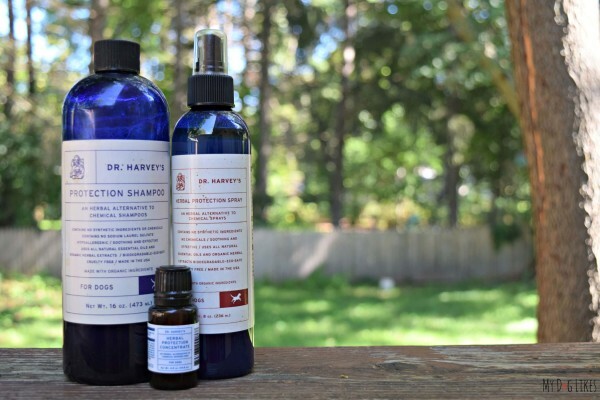 The Herbal Protection Shampoo from Dr. Harvey’s is a great natural pairing with the protection spray. 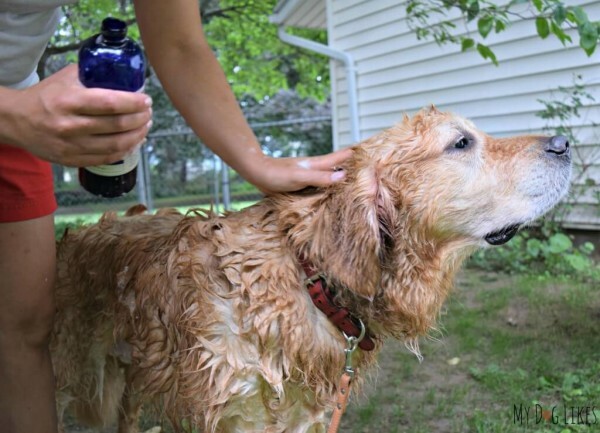 This all-natural and organic dog shampoo is gentle on your dog’s coat and skin. Since the product is all natural there are also no environmental concerns with washing outside with the hose or even in a local creek! Anyone with large dogs and a bathtub should be able to see the convenience of this!! As if that is not enough, you will also find many of the natural pest repellent essential oils from the protection spray to give your pet an added layer of defense. Our boys frequently develop skin irritations and allergy issues after swimming. We used this shampoo for the first time after a swim in a local pond to try and head off any potential problems, and it worked like a charm! A quick wash outside with the hose and days later the bellies were still white and smooth like they should be! 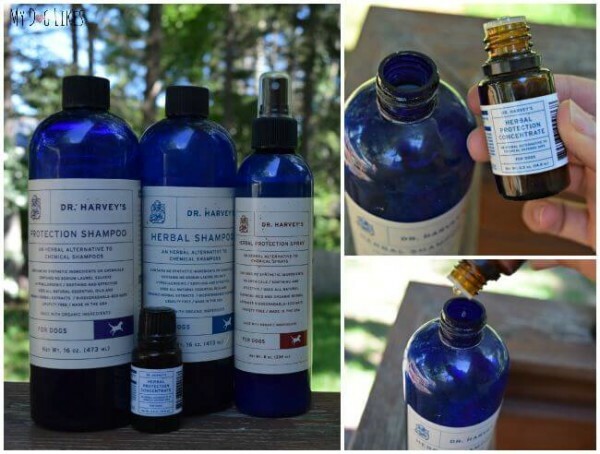 If you’ve ever had problems getting natural/herbal shampoos to lather, you will be happy to know that this was not a problem with Dr. Harvey’s! It lathered up nicely and had a subtle and soothing herbal scent. We found this shampoo to be slightly runnier than we are used to and would caution readers to be sure its in a spot where a clumsy canine (or human) cannot knock it over and cause a spill! Combining all of the elements you have now come to expect from Dr. Harvey’s herbal protection products, this concentrated form of the herbal protection formula is a great value and extremely versatile. Believe it or not, you can yield at least 10-8 oz. bottles of shampoo from this small .5 oz. bottle. Simply mix 20-30 drops with 8oz of water (spray) or your favorite natural shampoo and you are in business! Not only do we love having choices in what shampoo we use, we feel that it is a cost effective options for groomers and multi-dog households. Our region (Western New York) is certainly not know for its warm weather. We have a relatively short warm season, and a LOOONG cold winter! For this reason, fleas are not a huge concern for much of the year. On the other hand, our springs and summers are warm and wet – the perfect breeding ground for insects to thrive. While it is up to every individual pet parent which mode of flea and tick control they feel most comfortable with, we want pet parents to know that there are natural options available. In our household, we try to live as natural a lifestyle as we can. That is why we love that Dr. Harvey’s has given us an approach to pest control for our dogs that is similar to what we use for ourselves. We don’t apply chemical treatments to our own bodies to keep pests away; choosing instead to apply natural repellents when we head outdoors. While there is certainly a time and a place for invasive treatments, a more natural approach feels right for us.